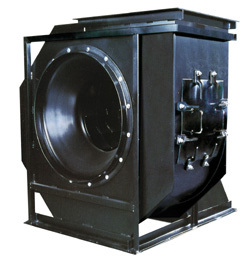 Products : Chicago Blowers : Design 10A Backward Inclined Fan - Draft Air, Ahmedabad, Gujarat, India. Chicago's Design 10A is a rugged multi-purose centrifugal fan equipped with Backward Inclined wheels suited for harsh duty applications. With heavier blades to resist erosion and corrosion, the Design 10A fan provides reliable operation in contaminated air with minimal maintenance. Similar BI wheels are used in Chicago's SQB fans for alternate duty applications. For clean airstreams, Chicago's airfoil bladed fans are recommended. Chicago's backward inclined blades are designed to handle corrosive or dusty airstreams. Typical applications include oven circulators, dust collectors, fume exhausters and emission control systems. The Design 10A is also suited for high 800�F. The solid steel blades are ideal for custom applied corrosion resistant coatings. Fan Sizes 22-1/4" to 73"